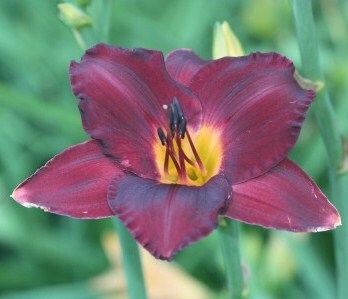 Tet (41" x 7" Dor, Mid to Late) (Flamenco Queen X Destined to See) A striking flower by any other name Italian Sunglasses sits tall above a lot of other daylilies with its dark red to mahogany base and sporting a near black chevron eye hovering above a brilliant yellow to green throat. TET 25" Mid Season Dormant. 5" bloom. (Canadian Boarder Patrol X Destined to See) This mauve beauty casts a warm glow over the garden with its chalky purple grey eye zone with a pencil red outline above a green throat, through its breading it brings ahead the slightly ruffled black purple edge that can be seen in some of my previous introductions. DIP (28" x 6" Dor, Mid ) (Flutterby x Double it) Big and tight this interesting shaped double will embrace any place you have for it in your garden setting this beautiful 2013 intro will wrap you in a big bear hug. DIP (44" x 6" Dor Mid) This daylily soars above the rest with its dark purple red base and black overlay. A slight ruffled edge accentuates its charm as it reaches up towards the sky and sets your skies ablaze.